In the vein of musicians-turned-actors, Jared Leto is a very familiar face in recent film history. Although he has always been the lead vocals, rhythm guitar, and songwriter for American band 30 Seconds to Mars, Leto will always be remembered as an accomplished actor for the numerous, challenging projects he has taken in his life.Born in Bossier City, Louisiana, Leto and his family travelled across the United States throughout Leto's childhood, living in such states as Wyoming, Virginia and Colorado. 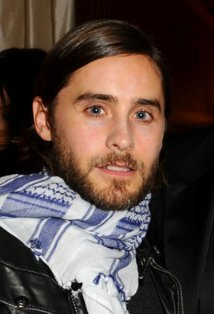 Leto would continue this trend when he initially dropped a study of painting at Philadelphia's University of the Arts in favour of a focus on acting at the School of Visual Arts in New York City.In 1992, Leto moved to Los Angeles to pursue a musical career, intending to take acting roles on the side. Leto's first appearances on screen were guest appearances on the short-lived television shows "Camp Wilder" (1992), "Almost Home" (1993) and "Rebel Highway" (1994). However, his next role would change everything for Leto. While searching for film roles, he was cast in the show, "My So-Called Life" (1994) (TV Series 1994-1995). Leto's character was "Jordan Catalano", the handsome, dyslexic slacker, but also the main love interest of "Angela" (played by Claire Danes). Leto contributed to the soundtrack of the film, and so impressed the producers initially that he was soon a regular on the show until it's end.Elsewhere, Leto began taking film roles. His first theatrically released film was the ensemble piece, How to Make an American Quilt (1995), based on a novel of the same name and starring renowned actresses Winona Ryder, Anne Bancroft, Ellen Burstyn, Jean Simmons and Alfre Woodard. The film was a modest success and, while Leto's next film, The Last of the High Kings (1996), was a failure, Leto secured his first leading role in Prefontaine (1997), based on long-distance runner Steven Prefontaine. The film was a financial flop, but was praised by critics, notably Gene Siskel and Roger Ebert. He also took a supporting role in the action thriller, Switchback (1997), which starred Dennis Quaid, but the film was another failure.Leto's work was slowly becoming recognized in Hollywood, and he continued to find work in film. In 1998, everything turned for the better on all fronts. This was the year that Leto founded the band, 30 Seconds to Mars, with his brother, Shannon Leto, as well as Matt Wachter (who later left the group), and after two guitarists joined and quit, Tomo Milicevic was brought in as lead guitarist and keyboardist. As well as the formation of his now-famous band, Leto's luck in film was suddenly shooting for the better. He was cast as the lead in the horror film, Urban Legend (1998), which told a grisly tale of a murderer who kills his victims in the style of urban legends. The film was a massive success commercially, though critics mostly disliked the film. That same year, Leto also landed a supporting role in the film, The Thin Red Line (1998). Renowned director Terrence Malick's first film in nearly twenty years, the film had dozens of famous actors in the cast, including Sean Penn, Woody Harrelson, John Travolta, Nick Nolte and Elias Koteas, to name a few. The film went through much editing, leaving several actors out of the final version, but Leto luckily remained in the film. The Thin Red Line (1998) was nominated for seven Oscars and was a moderate success at the box office. Leto's fame had just begun. He had supporting roles in both James Mangold's Girl, Interrupted (1999), and in David Fincher's cult classic, Fight Club (1999), dealing with masculinity, commercialism, fascism and insomnia. While Edward Norton and Brad Pitt were the lead roles, Leto took a supporting role and dyed his hair blond. The film remains hailed by many, but at the time, Leto was already pushing himself further into controversial films. He played a supporting role of "Paul Allen" in the infamous American Psycho (2000), starring Christian Bale, and he played the lead role in Darren Aronofsky's Requiem for a Dream (2000), which had Leto take gruelling measures to prepare for his role as a heroin addict trying to put his plans to reality and escape the hell he is in. Both films were massive successes, if controversially received. The 2000s brought up new film opportunities for Leto. He reunited with David Fincher in Panic Room (2002), which was another success for Leto, as well as Oliver Stone's epic passion project, Alexander (2004). The theatrical cut was poorly received domestically (although it recouped its budget through DVD sales and international profit), and though a Final Cut was released that much improved the film in all aspects, it continues to be frowned upon by the majority of film goers. Leto rebounded with Lord of War (2005), which starred Nicolas Cage as an arms dealer who ships weapons to war zones, with Leto playing his hapless but more moral-minded brother. The film was an astounding look at the arms industry, but was not a big financial success. Leto's flush of successes suddenly ran dry when he acted in the period piece, Lonely Hearts (2006), which had Leto playing "Ray Fernandez", one of the two infamous "Lonely Hearts Killers" in the 1940s. The film was a financial failure and only received mixed responses. Leto then underwent a massive weight gain to play "Mark David Chapman", infamous murderer of John Lennon, in the movie, Chapter 27 (2007). While Leto did a fantastic job embodying the behaviour and speech patterns of Chapman, the film was a complete flop, and was a critical bomb to boot. It was during this period that Leto focused increasingly on his band, turning down such films as Clint Eastwood's World War 2 film, Flags of Our Fathers (2006).In 2009, however, Leto returned to acting with his most ambitious film yet; Mr. Nobody (2009). Leto's role as "Nemo Nobody" required him to play the character as far aged as 118, even as he undergoes a soul-searching as to whether his life turned out the way he wanted it to. The film was mostly funded through Belgian and French financiers, and was given limited release in only certain countries. Critical response, however, has praised the film's artistry and Leto's acting.Jared Leto's story is a very charmed one, as he rose from television roles to film roles, to giving head-turning performances in famous projects alongside A-list casts. And all this on the side of his band, 30 Seconds to Mars. Certainly, it has not been easy for Leto, but he has earned his success and it will only fascinate to see what he does next.